It’s not every day that John Doerr sends us an email into our tip box. In fact, he didn’t send one today either, but someone using his name did. (Yeah, we checked with the real John Doerr, it wasn’t him). The Fake John Doerr wanted to tell us about a cool new search shortcut on Twitter.com. If you type in “sp” anywhere on the page (but not in the search box or the Tweet box) a new “search photos” box will appear that will search only photos. 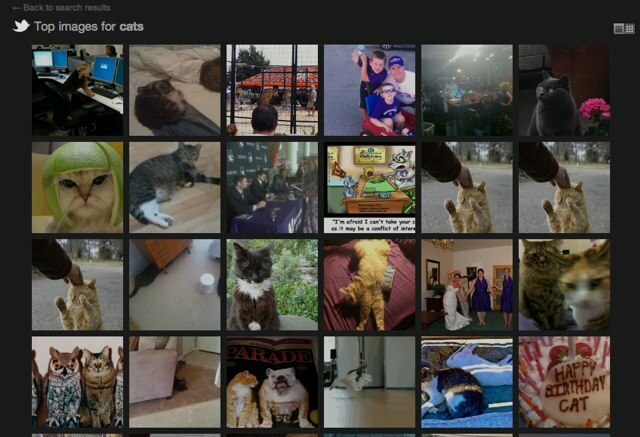 If you do that, you get a nice visual grid of photos people have Tweeted out. Okay, so this shortcut isn’t exactly new either (it’s been available since at least June), but nobody here at TechCrunch had seen it and I wasn’t able to find it mentioned anywhere other than on Twitter. We spent about 30 minutes trying to figure out if it was new. It’s not new, but it’s been hidden. Try typing in “cats” and see what you get. There is an even cooler shortcut search for videos. Type “sv” and a “search videos”box comes up. Results also appear in a grid and once you play one it goes to a timeline view. After years of only a spare stream of 140 characters and links, the visual display is almost startling. But it’s a glimpse at what Twitter could look like if it didn’t try to hide away all the visuals. Keyboard shortcuts, by the way, have always been a subtle part of the New Twitter design. Others you can play around with include “n” for new tweet, “r” for reply, “t” for retweet, and “m” for direct message.